You may have heard that you need to customize your resume each time you send it to a potential job opportunity. And, to a certain extent, that is true. As you write your new document, you need to ensure you are including as many key words as possible. These are the words that are prominent in the job posting and outline the skills, abilities, and qualifications needed for a new job. But, how can you easily do this so you don’t have to ‘reinvent the wheel’ each time you submit a resume? #1 – The job titles at the top of the resume. This should be the first section that someone reads when they review your document. If you are in sales, it may say something similar to: Sales Leader | Marketing Professional | Account Manager. These can either be past job titles you have held or a set of skills that you have honed through your career experience. If you choose to list skill-sets, you could say: Sales Leadership | Project Marketing | Account Management. #2 – The career summary. Immediately following the titles or heading on the resume will be the career summary. This will be a high-overview of you—the job candidate. Typically, the career summary will be approximately three to five lines and will start with several adjectives. So, you may say something like: “Dynamic, proactive, and team-oriented sales professional…etc.” By placing these adjectives at the forefront of the career summary, you can easily change those three adjectives to match words used in the job posting. #3 – The areas of expertise. The third section on your resume highlights short, succinct, and crystal-clear skills that directly align with key words in your desired position. This is the easiest and most obvious place to change words each time you send the document. Obviously, I wouldn’t recommend cutting and pasting the entire job description; however, be smart and choose your words wisely to be directly in-line with the advertisement. 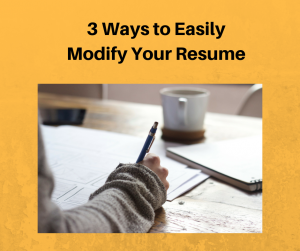 While you can certainly change other verbiage in your resume, these are the three easiest places to quickly modify your document and still get in-line with the job posting. By doing this, you don’t have to start-over each time you apply to a different opportunity. If you still have resume questions, download my Top 5 Resume Tips to GET THE INTERVIEW. Or, email me your resume (for a free review!) to heather@feather-communications.com.